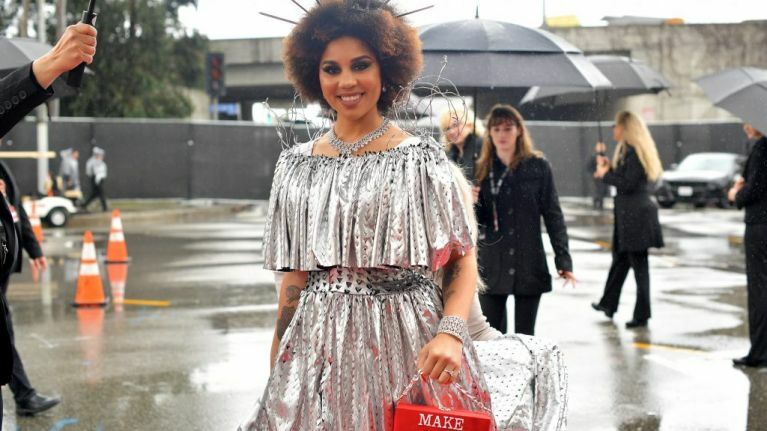 Joy Villa, a singer you likely won't have heard of, rocked up at the Grammys on Sunday night in a specially designed dress created in support of Donald Trump and the wall he wants to construct across the Mexican border. Villa, who is of Latino and African American descent, attended the 61st annual Grammys in Los Angeles wearing a long white gown with a brick design, fake barbed wire that was wrapped around her back and a spiked headband resembling the Statue of Liberty. She also had the words 'Make America Great Again' - Trump's campaign slogan - inscribed on both her purse and the back of the gown. In an interview on the red carpet at the event, the 31-year-old singer explained her outfit choice by saying: "I believe in building the wall to protect our southern border. Not to keep people out, but protect the citizens of our country. "I'm part Latina, I'm black and I believe in what the president is saying. This [the dress] to me is a representation of that in a very visual way and I always like making a statement." As she has now added "#MAGA dress wearer on @foxnews" to her Twitter bio, one can't help but feel the dress may have been a publicity stunt. May have been. At the 2017 Grammys she wore a blue dress, again bearing the MAGA slogan. The consequent publicity resulted in her album I Make the Static reaching number 1 among digital downloads on Amazon and iTunes in the US. At last years Grammy Awards she also wore a white dress with a hand-painted baby inside of a rainbow uterus on it along with a purse bearing the slogan, "Choose Life". What's in store for next year? My money is her dressing up as the sun to deny climate change or something revolving around Nelson Muntz's 'Nuke the Whales' poster.